A while back, the DJzone Bench performed a review on the ADJ myDMX 1.0 and we give it two thumbs up as an entry-level DMX-512 control system. American Dj recently released a new version of the myDMX unit that they of course named myDMX 2.0. This is the unit on the bench today. Out of the box, we saw ADJ gave this controller a new case that has a strikingly "Apple" look to it. If it was not for the silver color, you could easily mistake the unit for an Apple TV receiver. Unlike the 1.0 model, it has two outputs on it, one is a 3-pin and the other is a 5-pin. This gives both DJs and the diehard stage DMX junkies options to use it. Our software loaded fast on our Win7 machine (also works on Mac) and it downloaded the updates after it was installed. ADJ has upgraded the graphical interface to a slick new design that is easier on the eyes in a dark room or backstage environment. The basic layout is pretty much the same as the earlier version, but tweaks were performed in the color palette and menus. It is easy for a novice to quickly knock out a basic lightshow in minutes using the drag and drop, but this is barely scratching the power this software has to offer. Once we got comfortable with the basics, we moved on to some of the bells and whistles. 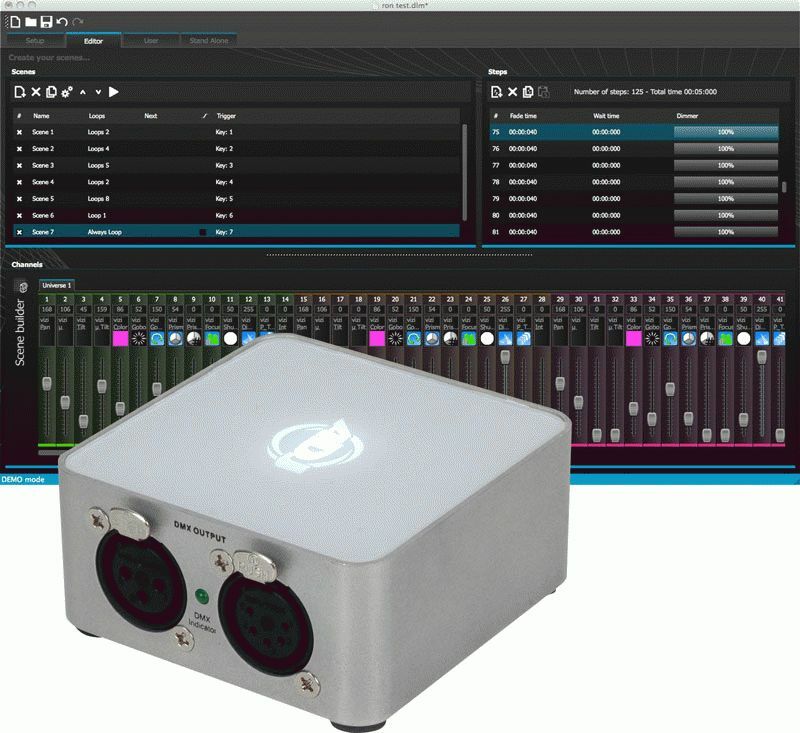 The myDMX2.0 has a huge bundle of features. RGB Matrixing gives you control over your matrix LED lights allowing you to create images and text. The Color Mixing Tool allows you to create complex colors on the fly. The built in Effects Manager allows you to create stunning effects with your lights without the work of programming them out step by step. You just create it in the manager and it generates the steps to make it happen. Other new features include the 3D Visualizer that allows you to build the room then setup the lights in the room giving you a virtual space to design your lighting. For those that are midi savvy, myDMX 2.0 includes a midi interface. By adding a midi signal to the mix, you can trigger the scenes you create.